Story: “A Side B Side Seaside” is the story of two girls’ farewell to their seventeen years of youth. 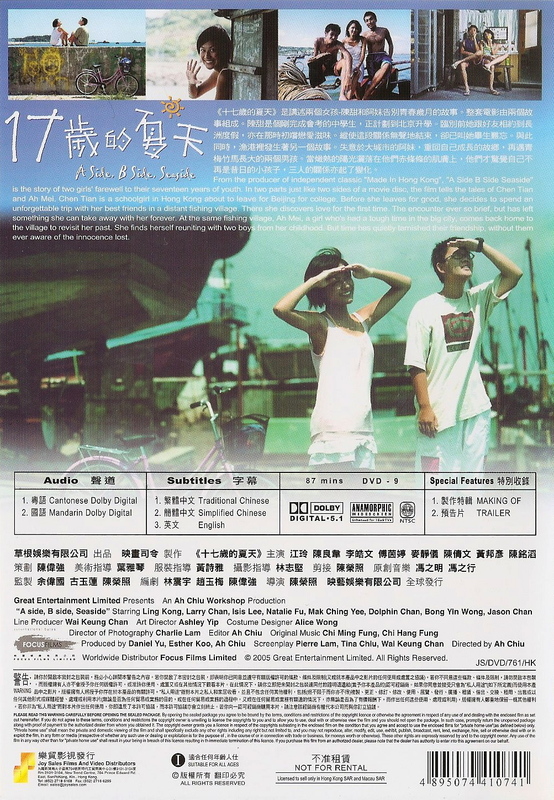 In two parts just like two sides of a movie disc, the film tells the tales of Chen Tian and Ah Mei. Chen Tian is a schoolgirl in Hong Kong about to leave for Beijing for college. Before she leaves for good, she decides to spend an unforgettable trip with her best friends in a distant fishing village. There she discovers love for the first time. The encounter ever so brief, but has left something she can take away with her forever. At the same fishing village, Ah Mei, a girl who’s had a tough time in the big city, comes back home to the village to revisit her past. She finds herself reuniting with two boys from her childhood. But time has quietly tarnished their friendship, without them ever aware of the innocence lost. 黑色犯罪小說作家，電影編劇，獨立電影導演，1997年開始撰寫影評至今(筆名皮亞)。生於香港，家族世代為越南華僑。畢業於香港浸會大學社會學系，及香港中文大學研究院。曾赴紐約大學進修電影製作，及於香港話劇團研習舞台演技。2004年獲韓國崟山國際電影節提名「新潮流導演」，2011年獲香港話劇團《夏日短劇節》「傑出演員獎」。2001年獲香港藝術發展局資助，完成首部編導錄像《人造色素》(2002)，其他編導錄像包括《我是貓》(2004)、《愛到發燒》(2008)。影片入圍香港亞洲電影節、韓國崟山國際電影節、台灣鬼魅影展「閉幕電影」、台北高雄新竹三地獨立電影展等。2005年加入電影編劇工作，先後撰寫多個電影劇本，及兒童音樂劇作。熱愛黑色犯罪電影，認為每個人內心都藏有一把槍。《死亡在跳舞》是林震宇首部發表的黑色犯罪小說，同系列小說包括《吃掉瑪利亞》等。 Pierre Lam is a Hong Kong Independent director, Scriptwriter, Film Critic and Novelist. He earned Master's degree from the Chinese university of Hong Kong and studied Film Production at the New York University. He further his studied on Stage Acting at Hong Kong Repertory Theatre and to be honored with "Outstanding Actor Award" in "Summer Shorts Festival 2011" organized by Hong Kong Repertory Theatre. His feature films include Fall in Love Too Easily (2002), The Cat of Hollywood (2004) and Some Like It Hot (2008). He was once nominated as “New Current” director at the Pusan International Film Festival, his works often selected by Hong Kong Asia Film Festival and Taiwan Phantom Film Festival as closing film . He is also the scriptwriter and directed children musicals. His first crime fiction published in 2012.